Looking for a steeple roofing contractor? The steeple roof is unlike others and can often perplex the would be steeple roofing contractor. Its daunting heights coupled with the steep incline makes it inaccessible to most roofers. 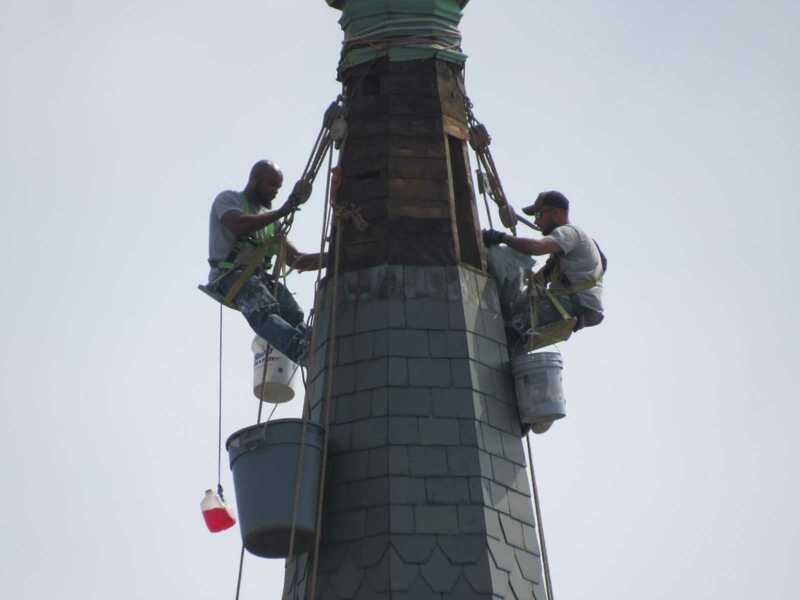 The steeplejacks of Inspired Heights are steeple roofers. Inspired Heights is a licensed commercial roofing contractor who specializes in steeple and church roofs. The steeple roof is unlike any other and often perplexes the would be church steeple roofing contractor. Its precarious location coupled with its steep incline and daunting heights makes it inaccessible to most other roofers. The steeplejacks of Inspired Heights are steeple roofers. Church towers, spires and steeples may be covered in traditional materials or new coverings that require specialized training to properly install and assure a secure steeple roof. 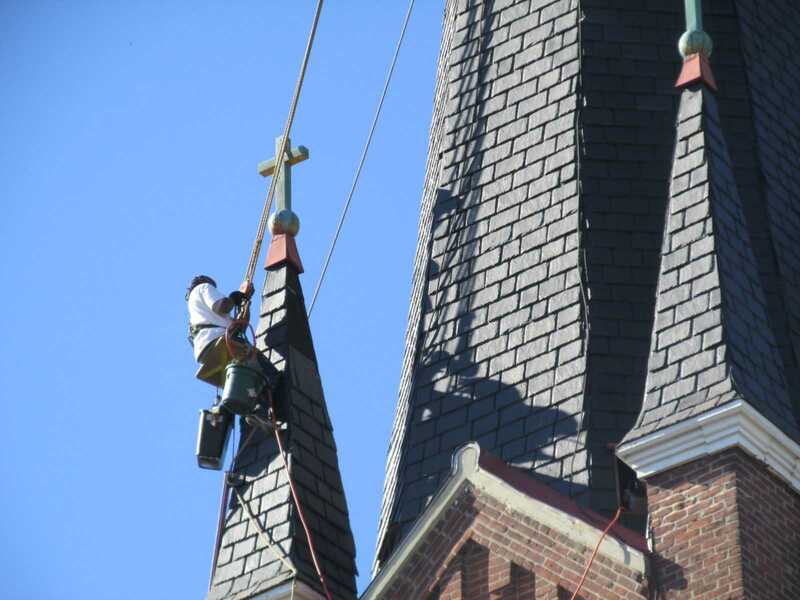 As a steeplejack company the trained professional roofers of Inspired Heights can repair or re-roof your church steeple with the confidence of an experienced church steeple roofer. 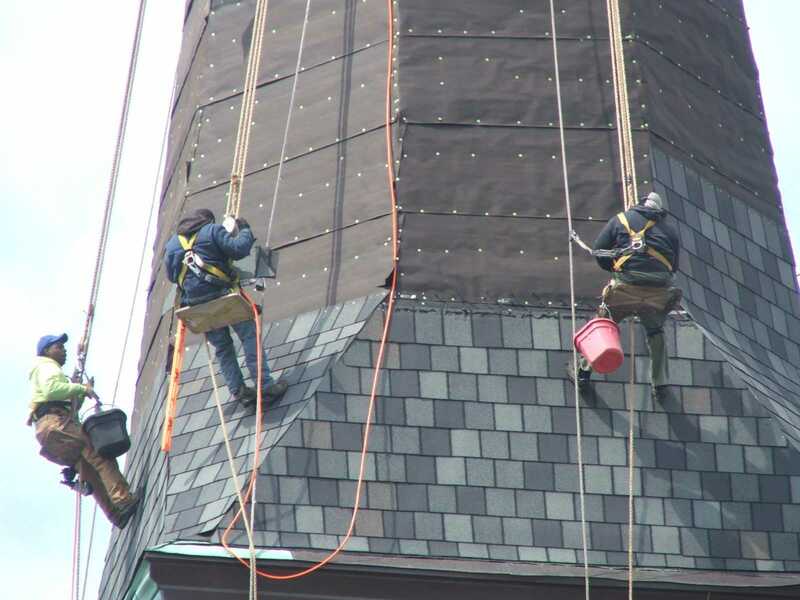 Using the cost effective techniques of a steeplejack we are able to save the church thousands compared to the high cost associated with the modern techniques (cranes, scaffold, etc) used by a typical roofing contractor to repair and/or install new steeple roofs. Inspired Heights, your steeple roof contractor! Inspired Heights, Inc is a nationwide steeplejack company that specializes in church steeple roof repair. Tony Stratton, the company president, is a third generation steeplejack experienced in church steeple roof repair. Year after year steeple roofs are exposed to the harshest of elements. High winds, freeze / thaw cycles and the beating sun can cause premature failure of the steeple roof. The steeplejacks of Inspired Heights can often save your church steeple roof without the expense of a complete steeple roof replacement. Metal replacement - metal steeple roof repair: ​Our steeple roof repairs often include replacing metal shingles, panels, flashing or ridge caps that have blown off in the wind. We can duplicate and fabricate most pieces on site and replace them, saving the church considerably on its steeple roof repair. Asphalt Shingled Steeple Roofs - new shingled steeple roof installation: Asphalt shingles come in many designs from the standard 3 tab shingle to the architectural to new designs that simulate wood shake and slate tiles. Many of the newer designs offer lifetime warranties and are wind resistant to hurricane forces. These main stream shingles are often affordable options for your steeple roof project. Slate Steeple Roofs - new slate steeple roof installation: Slate roofs on church steeples are known as not only classics in architectural designs but as the premier in church steeple roofs. ​Yet not all slate is equal, while 100 plus years is to be expected from some slates like Buckingham other less dense slate may not even get 50 years. Inspired Heights are the right steeple roofing contractor to select the right slate for your church steeple. However, no matter how beautiful slate can be it is also heavy, too heavy for some church steeple roofs. Fortunately there are some attractive faux slate available with 50 year warranties. ​Copper Steeple Roofs - new copper steeple roof installation: Copper steeple roofs are durable low maintenance staples with church steeple roofs. But even they may require repair or replacement on occasion. Inspired Heights are experienced copper sheet metal workers, fabricating and installing copper roof panels, shingles and ridge caps for copper steeple roofs. Decorative stamped copper shingles are also available for your church steeple roof. 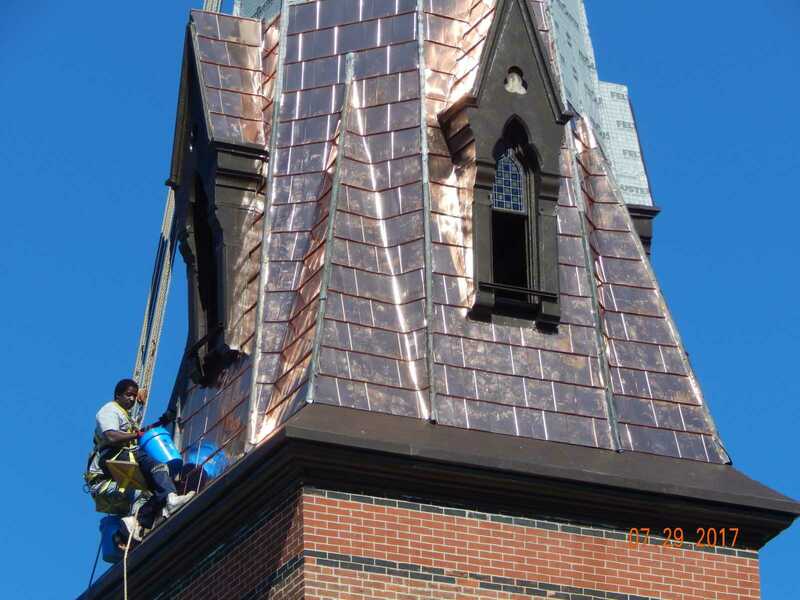 We also install and solder flat seam copper roofs on church towers and steeple roofs. ​Metal Steeple Roofs - new metal steeple roof installation: ​In addition to copper steeple roofs there are several other metal steeple roofs available. They range from prefinished stamped shingles to granular coated shingles with a slate like appearance. Prefinished metal panels are also an option for your metal steeple roof. They may be finished to look like Gold, copper or a brilliant white. They may be standing or flat seam but either choice is a good choice for a durable steeple roof. ​Wood Shake Steeple Roofs - new shake steeple roof installation: Cedar shingled steeple roofing and siding is a common material that has been used for centuries. But they don't always weather well. This is why we use modern versions and techniques that help the shakes last for decades. Cedar Breather underlayment permits the shake to breath and dry out before it deteriorates. Life Pine is a treated shake with a 50 year warranty. With quality materials we can install a wood shake steeple roof that will endure the elements for decades. We do church steeple roofs! 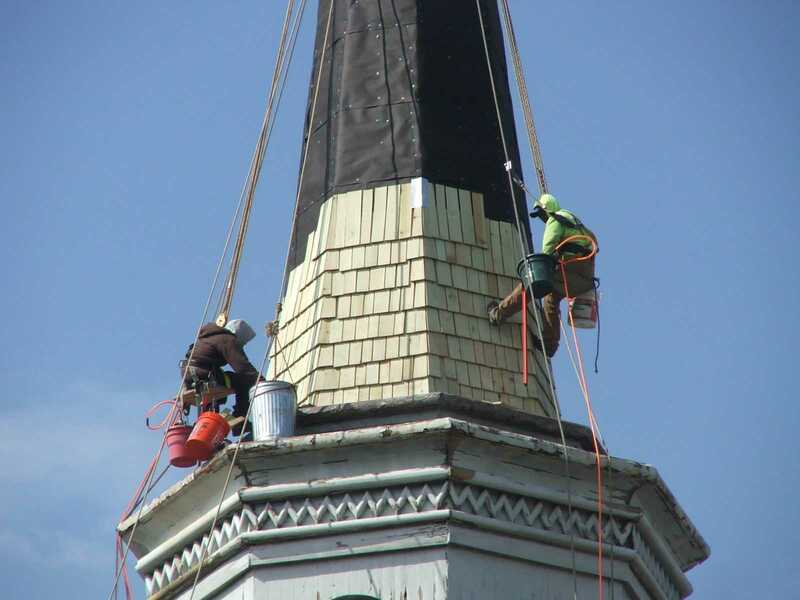 ​If you need experienced steeple roofers or a steeple roofing company for your church steeple roof, perhaps experts specialized in church steeple roofs then you need the church steeple roofers of Inspired Heights. Inspired Heights are steeple roofing contractors and steeplejacks that specialize in church steeple roofs. For your church steeple roofing project Inspired Heights are steeple roofing contractors. Church steeples are what we do. Inspired Heights is located near Chicago, IL and Milwaukee, WI in the city of Rochelle, IL but we provide our steeple roofing services nationwide. So if you're outside our local areas of Chicago, Milwaukee and Rochelle then we're still the steeple roofing contractor for you. We are steeple roofers, repairing steeple roofs, performing steeple roof repairs and steeple roof installation. We work with a variety of materials on steeple roofs including slate steeple roof, historic steeple roofs and metal steeples like copper steeples, copper and metal shingled steeple and prefinished metal steeples. Of course as a steeple roofing contractor we also work with asphalt shingles on steeples.